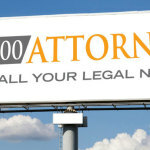 Why Should a Lawyer Use a 1-800 Vanity Phone Number? There are Many Benefits of Using A Vanity 800 Number for Your Law Firm. The key to any law firm’s advertising campaign is the ability to draw in as many new clients as possible. Countless studies have shown that when you gear your offline advertising efforts around a good 1-800 vanity number, you will see far more success for your efforts. The goal of advertising is to get potential clients who see or hear your ads to then contact your law firm. With most forms of advertising, this requires significant effort on the part of the potential client. When was the last time you remembered a 10-digit numeric phone number from a TV or radio ad, billboard, etc? Probably never. A vanity number gets around this hurdle by making your phone number easier to remember. If you’re able to secure a top-level 800 vanity number like 1-800-ATTORNEY, you can be certain that more of your potential clients will remember your phone number. Studies show that 68% of people will remember a phone number expressed as a word, versus only 16% who remember a numeric number. One study shows that using a 1-800 vanity number in a radio ad can increase your incoming call volume by 14 times when compared to a numeric 1-800 phone number. A Chicago Tribune advertising survey found that advertisers using 1-800 vanity numbers were getting ten times the amount of response to those advertising with a local numeric number. In a national survey, 91% of respondents said they prefer a 1-800 prefix over 1-888 because 1-800 is easier to remember and people reflexively dial the 800 prefix even when calling another toll free exchange. Another benefit of a strong vanity phone number is branding. Branding allows a law firm to promote itself in such a way that potential clients become familiar with its brand. When they recognize a firm’s brand, it helps with the decision-making process involved in choosing an attorney. With the 1-800-ATTORNEY vanity number, there is no doubt the business is a law firm, and as we already stated, it’s a number that is incredibly easy to remember. You don’t have to write it down or wonder why you needed the number in the first place. Brand identification is important for lawyers, and the right vanity number can make it easy to accomplish. The use of a vanity number can bring an instant level of prestige to a law firm. When potential clients see that your firm uses a trusted industry-leading number like 1-800-ATTORNEY, they will associate your business with the prestige behind the brand, and it makes the decision making process much easier for them. Think of the industry-leading vanity numbers out there. 1-800-CONTACTS, 1-800-DOCTORS, 1-800-FLOWERS, 1-800-DENTISTS… Now you can be the sole attorney using the 1-800-ATTORNEY phone number in your state! If you’re interested in leasing 1-800-ATTORNEY for your firm, call 1-800-704-3578 any time, day or night. Alternatively, you can use the email form on this page and we’ll get back with you with information on pricing and availability.